Taking a bite of lemongrass tofu fresh spring rolls is like home rolledÂ up in a chewy rice wrapper. Sometimes I feel like I’m being tugged between so many different placesÂ that I don’t know where home is anymore. Where my parents’ live is where I grew up, where I called home while travelling the world, and whereÂ love first found me. In Ottawa, I learned what the world is likeÂ without boundaries. My roots began to burrow,Â and I fell out and then back in love again. Toronto is where I really learned about who I was, who I wanted to be, and who loved me for who I am. I’m at a crossroads, trying to figure out where to go next. Chris has no idea where he’ll be after this semester: grad school, working, maybe even back in Northern Ontario. When he graduates, I hope to follow so we can finally build our lives together, but there have been so many obstacles in between that the future seems so hazy. So unknown. I’ve never been a fan of the unknown. There is comfort in knowing what’s in the dark; knowing where to draw the lineÂ because the limits have already been tested.Â But this unknown is so far out of my elementâ€”where is home? Is home with family? Is it where I found myself? Or is home with Chris? All I know is that no matter where I am, I will continue to rediscover my roots through food. Food grounds me and reminds me of who I am. There are certain boundaries that can always be pushed with food, and when things fail, we can eat the edible bits and scrape away the rest. There will always be new foods to try, and comforting foods to fall back on. 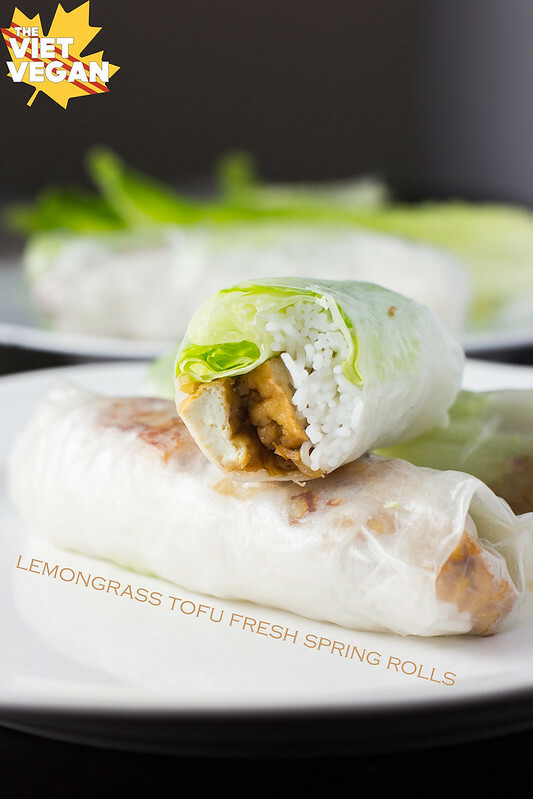 Try a bit of comfort from my home: lemongrass tofu fresh spring rolls. 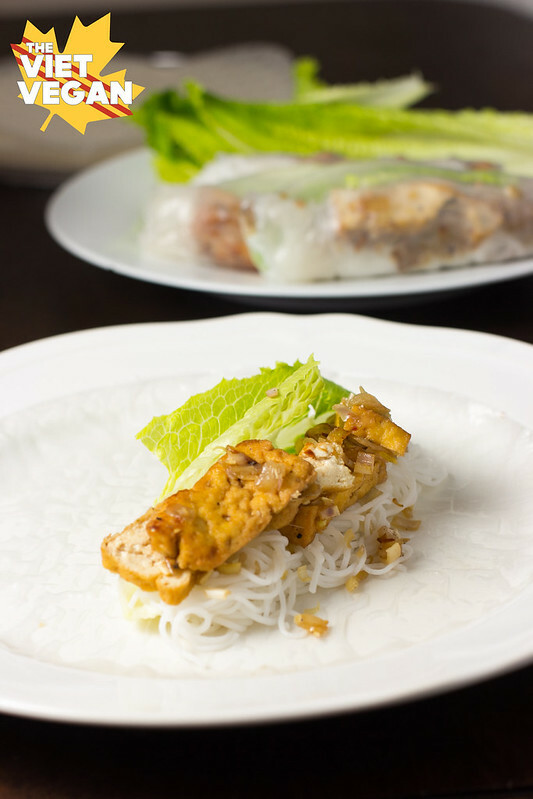 The crunch of lettuce with the perfect chewiness of rice noodles is a blank canvas on which lemongrass tofu shines in brightly spiced tenderness. Feel free to add more crunch with quick picked veggies and cucumber, or be lazy like me and keep it simple. It’s like second nature to make these, rolling them is like brushing my teeth. No need to think about it. Instead my mind wanders and wonders where I’ll be when home finds me. Cook rice noodles until tender, then drain. Pour back into a pot and cover with cold water to get rid of extra starch. Drain again and segment into servings in a colander or strainer (makes it easier to separate later, as they tend to cool as one giant clump otherwise). To prepare, dip a rice wrapper in hot water and place on a large plate to soften. Place one leaf or romaine on top, ripping it into segments to fit in the middle of the rice wrap. I like to push the contents of my wrap just under the middle actually. Layer about a 1/3 cup of rice noodles along the romaine. You can also add the quick picked carrots and daikon and cucumber here, but I didn't have those on hand. The main attraction here is the lemongrass tofu. Add 3-4 slices, then wrap by folding the sides in and then rolling up. Repeat until you run out of tofu, or until you've made as much as you'd like to eat. =) Glad to share the lemongrass love! thanks for commenting, Andrea!